Wondering how to advertise a yard sale? You may think that classified ads are dead. They’re not. Serious yardsalers still make a point to look through the classifieds each week when plotting out which yard sales to visit… and which ones to skip. While online advertising is definitely more popular (and I have some tips for placing yard sale ads online too), you shouldn’t overlook this often-overlooked gem. Keep in mind, most printed papers also have Internet versions — so your print ad is viewable online as well. Order a classified ad in your local newspaper and/or other classified papers that may exist in your area — like a a weekly “Thrifty Nickel“, “Coffee News“, or similar paper. Tip: You will probably need to order your ad by Monday to have it show up in Thursday’s paper. Sites like Craigslist and other “free ad sites” work wonders because the ads are read by people in your own town or geographic area. Tip: This only happened to me once, but supposedly it happens a lot… If you advertise your yard sale publicly, then people may come to your house the day before and ask to see the items you’ll be selling because “they can’t be there tomorrow.” Dealers and collectors are famous for doing this. As are those die-hard yardsalers who are trying to plot their course for the next morning, in an attempt to decide which sale they want to get to first! So be prepared for early birds and people asking if you’ll pre-sell some things. Post signs in various locations throughout your neighborhood and near other places that you frequent. The best advice I have with regard to yard sale signs is… the fewer words the better. Remember, your sign must be readable from people who are driving by quickly! 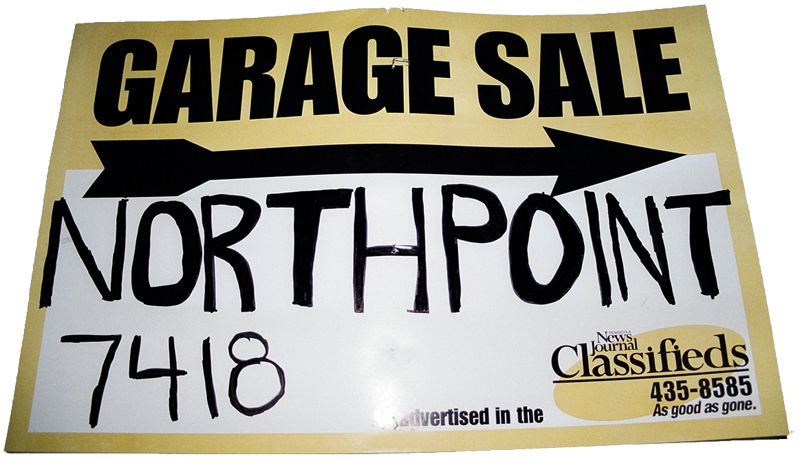 Tip: Here are some of the best words to use on your garage sale signs. Regional & community websites tend to have a very loyal following of people who live in the area. I know my neighborhood has a Facebook page, as well as a private forum where neighbors share local tips and ideas. If you live in a subdivision, then yours probably does too. Post something about your yard sale on those sites, or simply leave a comment about your yard sale on an existing article that appears on those websites. Tip: Here are the top 6 yard sale search websites & apps where you should post your garage sale. It can’t hurt to start some chatter about your upcoming yard sale in the forums and chat rooms that you visit — especially if they include a lot of locals. Tip: If you’re lucky enough to take part in a neighborhood yard sale in your community, then you’re all set… most of the advertising is done for you. You can pretty much just sit back and wait for the crowds to arrive! If it’s a multi-family sale you’re having, then you should all combine your efforts to put some creative ads and signs in place. When advertising your garage sale in a classified ad (or in a bulletin board or forum posting), don’t just list the date and time of your yard sale. Instead, start with a few key catchy words that aren’t typically found in yard sale ads. Scrapbook stuff… everything must go! …even if you only have one item in any of the above categories, it may be the one thing that attract more people to your sale! GARAGE SALE: Sports memorabilia, Home Interior, kids toys, lawn & garden tools, Baby Gap, auto parts, vintage jewelry, dishes, Craftsman tools, collectibles, and LOTS of items priced under $1! Snacks & drinks available. Saturday April 21st from 7AM-1PM. 1234 Yard Sale Lane, Nashville.